Oh! the sweet slumber of a baby! And what better way to document that than with the soft pinks and yellows in the Hello Baby collection?! Suzanna here today to share with you photos of myself as a baby on a layout created using this most darling baby collection. There is a lot of great product to select from as there is a blue biased and pink biased collection, both “Hello Baby”. I used Echo Park’s Moon & Stars cut file, Design ID 277334, from the Silhouette Store to create the moon and cut that from the B side of the Alphabet Blocks patterned paper. There’s something about hand-stitching that just belongs on a baby page to me and so, of course, I had to hand-stitch around the edge of the moon. I love the dimension it provides! Every moon must sit nestled amongst the stars, right? I created a starry sky by using texture paste with a hint of shimmer (think Twinkle, twinkle little star?!) 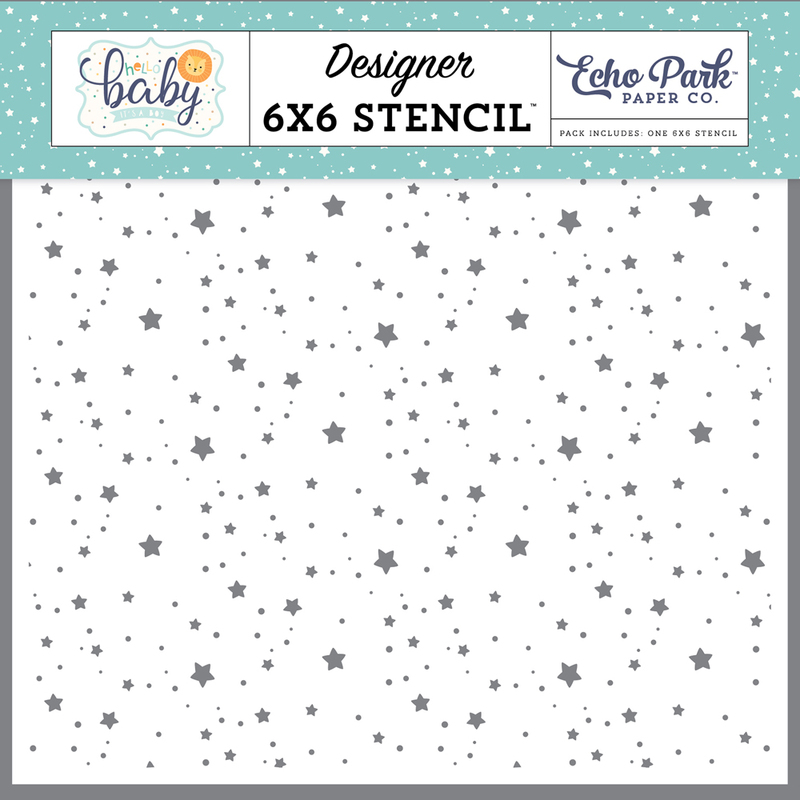 and the Twinkling Stars stencil that accompanies the “It’s a Boy” version of the Hello Baby collection. A host of chipboard pieces and stickers fill in for embellishments. I toyed with the subtle blue chalk layer onto but refrained as the darker photos really needed the “pop” from the white background. Multiple photo titles are kinda my jam. The chipboard piece “baby” worked perfectly between the die cut letters cut out used scraps from the paper I used to cut out the moon and the Oh Baby Word Die Set. The contrast of the teeny, tiny blue puffs of cloud adds some visual interest and draws your eye to the title cluster. The clouds are stamped using the New Arrival Stamp Die/Stamp. You will have to fussy cut the cloud as there isn’t a corresponding die for that particular shape. And that, my friends, is me 46 years ago! You CAN use modern collections with vintage photos! Just because the photos are “vintage” it doesn’t mean that I am though! Be sure to head over to my YouTube channel for the process video if you are so inclined! Thanks for stopping in today! I hope to see you again soon!